Instant Replay Access to October's LIVE STREAM Class is NOW AVAILABLE for you to watch today! Hi, I'm Kim St. Jean Jewelry Artist, Designer, and Author. I bet you wonder what I'm doing with a box of scrap that looks like this. My students know that I have Buddha and all of my silver scraps go to Buddha, that's because Buddha gets reincarnated into beautiful new Jewelry. 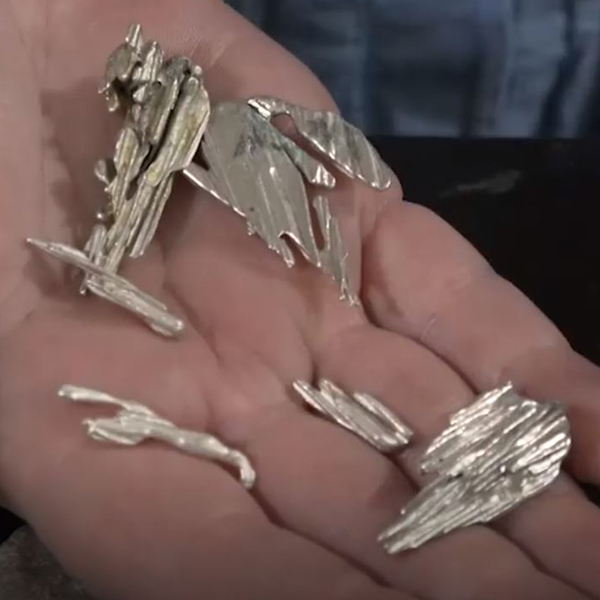 Join me in this previously Live Streamed Class, where you're going to learn how to make awesome gallery quality jewelry out of all of your silver scraps. We're going to be doing scrap casting. The first two lessons are going to be you actually learning how to use 6 different mediums to cast the scraps that you have. The second two lessons we're going to take the things that we've poured and we're going to be making beautiful hand-made finished jewelry. Join me, and together we will discover the world of "Scrap Casting Fabrication & Jewelry Design". Kim's Brand New "Secret" Method - Kim is excited to show you a new medium you can pour into that creates a very unique look that is impossible to create any other way. 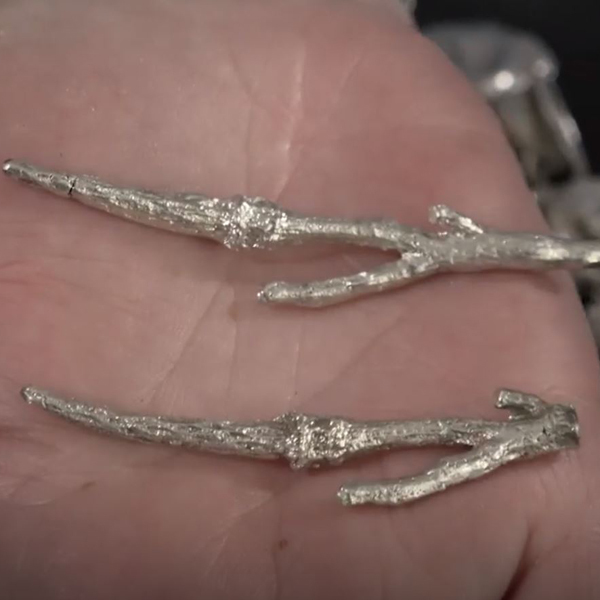 Pine Needle Casting or Broom Casting - You'll love this method because each casting has a linear, long, organic shape that is fascinating to get to work with setting stones, using as prongs or you can add a bail and simply wear as they are. Water Casting - The water casting is done by pouring molten metal into water and each casting has more of a floral Lily or exploded flower form, organic soft shape. Salt Casting - We pour the molten metal into the salt and it forms these gorgeous sea coral like shapes then we can add pearls or half drilled stones or we can incorporate it with the pine needle casting or water casting we've done on the previous days. Sand Casting - In sand casting we will be doing two dimensional castings & three dimensional castings. On 2D castings you will press a form into the sand and then pour the molten metal on top. On 3D casting you'll press the mold in the sand, then add more sand on top. In 3D casting you'll be able to make rings or complete objects. 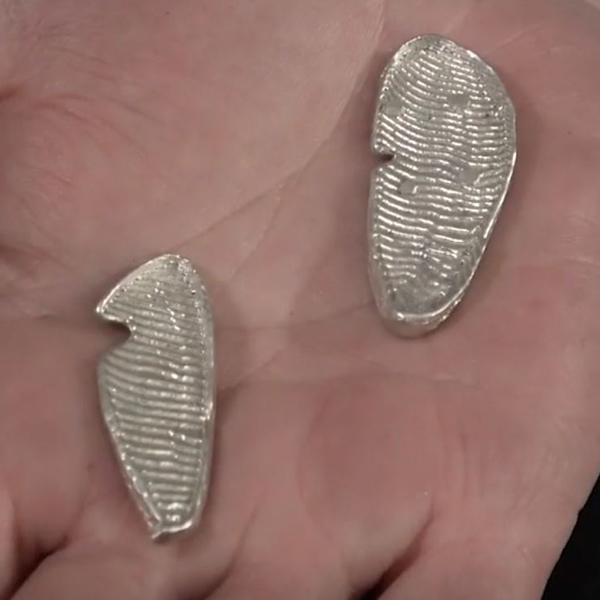 Cuttlebone or Cuttlefish Casting - With cuttlebone casting you'll be carving out designs and then pouring in the metal to create your own hand carved designs in metal. We priced this series of classes so that everyone can afford to take some time for yourself and discover one of my favorite jewelry making techniques, the best part is you can watch it again on-demand whenever you want and as often as you want. I know you'll love this method of jewelry making as much as I do!! Click below to reserve your virtual seat in class.. 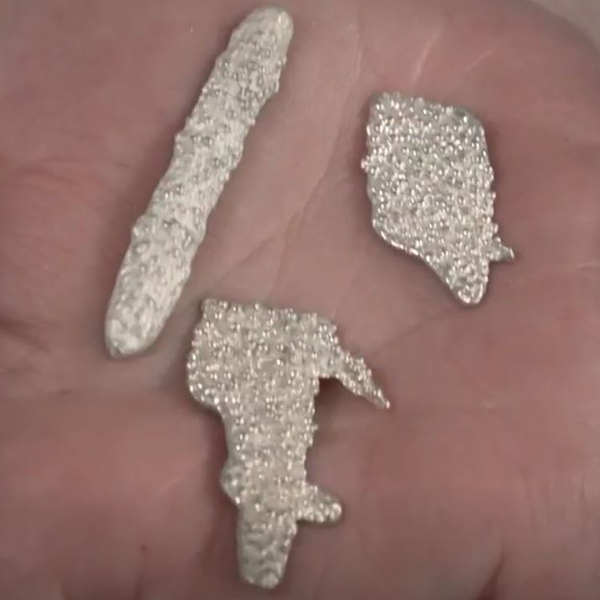 Create an incredibly unique, bubble type texture in your metal with this medium that Kim discovered. You'll love this method because each casting has a linear, long, organic shape that is fascinating to get to work with setting stones, using as prongs or you can add a bail and simply wear as they are. The water casting is done by pouring molten metal into water and each casting has more of a floral Lily or exploded flower form, organic soft shape. We pour the molten metal into the salt and it forms these gorgeous sea coral like shapes then we can add pearls or half drilled stones or we can incorporate it with the pine needle casting or water casting we've done on the previous days. In sand casting we will be doing two dimensional castings & three dimensional castings. On 2D castings you will press a form into the sand and then pour the molten metal on top. On 3D casting you'll press the mold in the sand, then add more sand on top. In 3D casting you'll be able to make rings or complete objects. 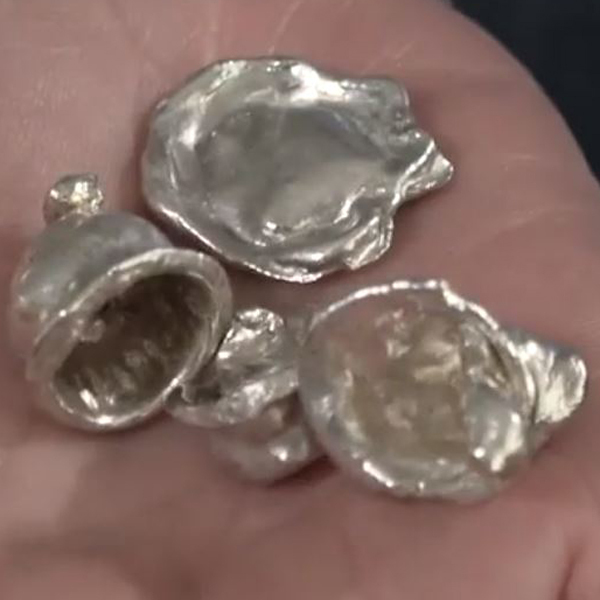 With cuttlebone casting you'll be carving out designs and then pouring in the metal to create your own hand carved designs in metal. Which Of These Beautiful Projects Would You Like To Create With Us? 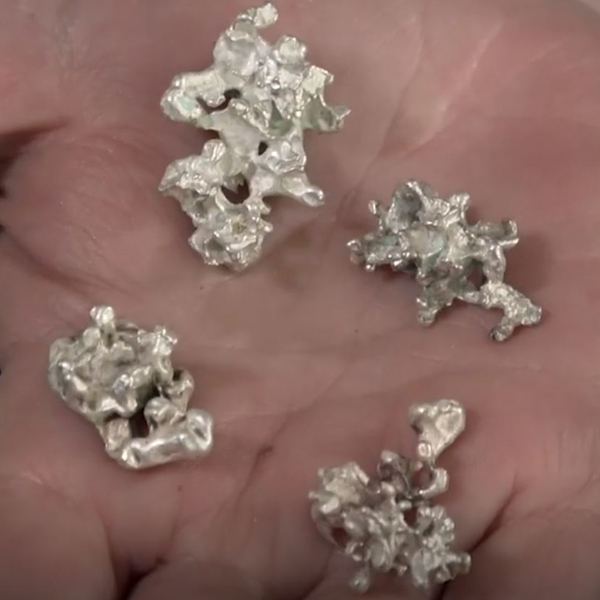 I love this method of jewelry making because you get to use your scraps of silver to make something new from it and the designs that come from this form of casting come from natural materials and add a whole new dimension to the stones and elements that you'll be setting in the castings. I've got a lot of new projects to show you. On the 3rd and 4th lessons we're going to take all these awesome components from the first two lessons and we're going to turn them into professional gallery quality pieces of jewelry. Just to wet your appetite, I have just a sample of some of the things that you can make. These are real pieces of jewelry that my students and I have created during class. Using the techniques that you're going to discover in this course you'll be able to come up with a limitless number of design possibilities. I'm really excited to get to work with you, its going to be a blast. How Does Live Streaming Work? For months, even years we've searched for a way to do this, and finally the right video and technology people have stepped into our company and now we are able to offer it. A live experience, with multiple cameras capturing all the angles you need to follow along as if you were there with us, and dare I say maybe even better than being in person. After all, when you go to a live jewelry class do you get to look right down on top of the instructors hands the entire time in high definition without leaning over, bending your neck or straining your eyes to see it? Do you get to work from the comfort of home in your ideal Jewelry Making Environment, where you can wear what you want, always be on time, and where you have every tool available? Well that's what you get in a live streaming class, and because you're attending over the internet we can accommodate a lot more students without the higher price of an in person class where we have limited seating. It's really simple. You log in, click on the class or classes you've selected to attend at the time of the class and a video player will bring you right into the class as if you were there in person with us! Thank you for being a loyal customer! I'm excited to see all the great things you make during these classes. Click on the button below to get instant access. WHO IS KIM ST. JEAN? Following ten years as a public school teacher, Kim combined her love of teaching with her creative talents and began teaching jewelry classes. Mostly self-taught, but with silversmithing mentorship from Dan Haga along the way, she now has been teaching jewelry classes for nearly twenty years. She is an award winning instructor, author and jewelry designer. Kim has been published in numerous magazines and books. She has appeared on several beading and craft television programs, and has written three books: "Mixed Metal Mania", "Metal Magic", and "Colorful Wired Jewelry". Kim was elected one of the Top Ten Instructors in the country by the attendees and staff of the Bead and Button show. Kim has also filmed over twenty stone setting videos for WireJewelry.com. Her husband Norm followed Kim in the jewelry arts after a twenty-five year career in textile management, and now travels with her assisting in the classroom. Their home base is in Myrtle Beach, SC, where they teach at their studio, Studio St. Jean. They can also be found teaching across the country at various clubs, guilds, bead shows and art shows. Do I Need To Travel? What are the hotel arrangements? NO! That's the best benefit of what we're offering today. You can simply watch the class on your computer, smart phone, tablet or iPad wherever you have an internet connection. Later, if you choose our DVD upgrade option, we'll send you a DVD recording of the class, edited to make it quick and easy to follow along. What about supply kits? After you register for the classes you want, a supply kit list will be provided and you'll have the opportunity to purchase the supplies that will be used in class. What Types of Devices Work? Any device with a good internet connection, that could play a youtube video or any other online video format will work. Android Smart Phones - Yes! Google Chrome Cast - Yes!